Think you're a lightning texter? Then you might be in with a chance of winning $25,000 (£13,000) in the US National Texting Championships . Entrants stand, hands behind their backs, waiting for the horn go. When it does, it's a race to see who can grab their phone and copy down the text - which appears on a screen in front of them - the fastest. The winner is the first to send their text to the judge's phone. The texts get longer and harder as the competition goes on. 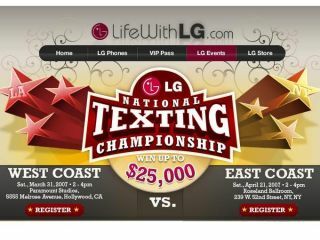 It's a joint LG / Verizon promotion, and contestants must own an LG enV or V phone connected to the Verizon network to be eligible to compete. The phones must have their predictive text functions turned off and the use of abbreviations is not allowed. Contestants pay for the texts and LG won't provide enV or V handsets. Interestingly, the enV and V phones have Qwerty keyboards as well as number keys on the front - the rules don't mention which set of keys contestants have to use. The contest is split into two heats: Hollywood on March 31, and New York city on April 21. Britain has had its own texting championships. In 2002, Phones 4 U ran a competition comprising of eight heats all around the country. And in 2004, James Trusler , 30, from West Sussex became the world's fastest texter.